Pam likes to make several batches of these sweetmeats in November or early December. A dozen or so, wrapped in cellophane, are a charming gift. Needless to say, you don't need to stop at oranges: lemon and grapefruit peel work equally well and you can use milk, plain or white chocolate for dipping. The glucose syrup is optional, but does prevent the sticks becoming too hard. It is best to keep the candied sticks in an airtight container and only dip them in chocolate when you want them. Scrub the oranges and using a sharp knife, remove the peel and attached pith. Weigh out 250g or peel and cut into slices about 6mm x 5cm. Place the peel in a large pan and cover with 2 litres of cold water. Bring to the boil and simmer for 5 minutes, drain and return to the pan with 1 litre of cold water. Bring to the boil again and simmer, covered, this time for 45 minutes. Then add the sugar and stir until it's dissolved, simmer for a further 30 minutes, still covered. Remove from the heat and leave to stand for 24 hours. Bring the pan to the boil again - if using glucose syrup, add it now - and boil for 30 minutes, until all the liquid has evaporated and the sticks are coated with bubbling syrup. Allow to cool then carefully remove sticks to a wire rack. Leave in a warm place (an airing cupboard is ideal) for 24 hours. Break the chocolate in to pieces and melt in a heatproof bowl over a pan of simmering water. 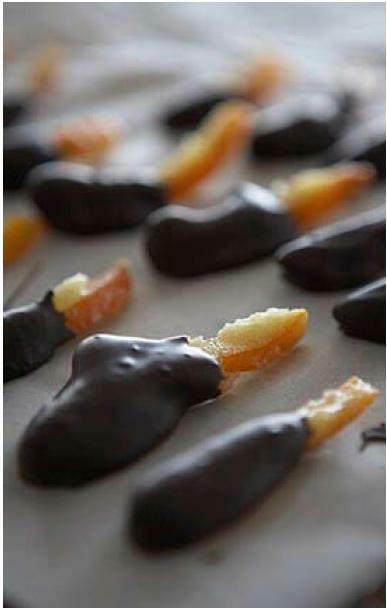 Remove from heat and dip half of each orange stick in the melted chocolate, placing on greaseproof paper to set. Before dipping the sticks will last 3-4 months, once dipped in chocolate they are best eaten within 3 weeks. There are many more recipes which are exclusive to members of River Cottage. Simply login or become a member to access these. Become a Member of River Cottage and take advantage of the many benefits this has to offer!